It has been ten years since fans worldwide last saw the loveable toy characters from the animated Toy Story saga come to life on screen. 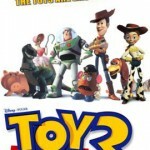 In Spring 2010, Disney-Pixar breaks open the toy chest once again with the anticipated release of Toy Story 3. On June 18, WOODY, BUZZ LIGHTYEAR, and all of their toy-box friends will embark on yet another fun-filled adventure, this time outside of Andy’s home at Sunnyside Daycare as he heads off to college. The popular MR. POTATO HEAD character reprises his role in the Toy Story 3 movie, and Hasbro has the toys to celebrate! Favorite characters from the film such as BUZZ, WOODY and JESSIE are re-imagined in tater form this year, and of course the original spud himself, MR. POTATO HEAD, is available in an exciting electronic talking version. Continue the excitement at home with Hasbro’s new line of Toy Story 3 games. Get in on the action and help BUZZ LIGHTYEAR fight back with the Toy Story 3 SPACE SHOOTER GAME. 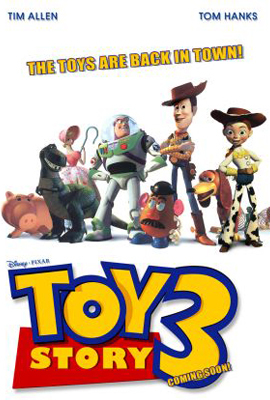 Players will go to “infinity and beyond” and use an authentic BUZZ LIGHTYEAR Space Ranger Blaster in this exciting game based on the Toy Story 3 motion picture. Hasbro is also debuting new Toy Story 3 games based on classic brands that families know and love. Fix BUZZ LIGHTYEAR’s malfunctioning parts and get him back to his adventures in OPERATION: Toy Story 3 Edition. Play the saddle-stacking game of BUCKAROO with Toy Story’s BULLSEYE the horse and carefully load him up with everything needed for the toy’s adventure. And bring the Toy Story 3 characters to life for younger fans with the games of YAHTZEE JR. and MEMORY that have been given a Toy Story 3 twist. To see the full press release and product list click on the title bar above. Stay tuned to Toyark.com this weekend for our 2010 Toy Fair coverage. Everyone's favorite spud "comes to life" like never before with the lively POPPING TALKING TATER toy! This interactive MR. POTATO HEAD pal plays MR. POTATO HEAD Says, tells jokes as kids mix 'n match his seven removable pieces, and plays a game that challenges kids to get all the pieces in place in ten seconds flat! Children will adore this silly tater that also spins, shakes and pops out all his pieces for a giggling good time. Requires three "AA" batteries, included. Available at most major toy retailers nationwide and on HasbroToyShop.com. This 10-inch plush potato is a cuddly version of the on-screen favorite. Kids will be delighted to take home the MR. POTATO HEAD character from the Toy Story trilogy and hear what he has to say! Just give him a hug to listen to more than ten different sayings from the movie trilogy. Requires three "AA" batteries, included. Available at most major toy retailers nationwide and on HasbroToyShop.com. This cute cowboy spud is ready to wrangle up some fun! Dressed like WOODY from the Toy Story movies, this MR. POTATO HEAD character features a cowboy hat, vest, boots and belt for a rootin' tootin' good time! Available at most major toy retailers nationwide and on HasbroToyShop.com. Kids can reenact their favorite scenes from the Toy Story trilogy with this adorable SPUD LIGHTYEAR figure. The playful spud sports a space outfit just like BUZZ LIGHTYEAR's, from shoes to protective visor. Available at most major toy retailers nationwide and on HasbroToyShop.com. The classic MRS. POTATO HEAD figure puts on a pop culture outfit for the very first time! Debuting as JESSIE, this cowgirl getup will have playful tots yelling yee-haw just like the Toy Story character! Available at most major toy retailers nationwide and on HasbroToyShop.com. Mr. and Mrs. are ready for adventure with the rest of the Toy Story 3 gang! These classic POTATO HEAD characters look just like they do in the movie, from hats down to shoes. Available at most major toy retailers nationwide and on HasbroToyShop.com. Activate the SPACE SHOOTER and target the enemy toys! See how it feels to be BUZZ LIGHTYEAR as you collect tokens and earn points by blasting rival toys with BUZZ�s authentic Space Ranger foam disc blaster. Help protect the toys and bring them to safety with the Toy Story 3 SPACE SHOOTER GAME. Bring BUZZ LIGHTYEAR back to full flying speed by removing all 13 of his malfunctioning parts without touching the sides of his spacesuit and setting off the laser sounds. Extract BUZZ�s Toasted Turbo Booster, Crystalic Confusion or Battered Blaster and earn the most money to win the game. Load up BULLSEYE the horse, but watch out � he may buck at any second without warning! Gently saddle him up and load on Toy Story gear, including a riding boot and hat. Will he get too excited and kick up a storm and send everything flying? You never know what will set him off! He�ll make you jump with excitement as he kicks the load off his back. Be the last to load the horse without losing the gear, and win! Score the most points by rolling as many of the same Toy Story 3 characters pictured on the dice. On each turn, roll the dice up to three times. The more matching dice of a character you roll, the higher you score. The highest score wins! Get ready to embark on a matching mystery as you feed your preschooler�s curiosity with images of familiar Toy Story 3 characters. Match and collect pictures of WOODY, MR. POTATO HEAD and HAMM, as well as some new faces in the Toy Story 3 toy chest. If you have the most matches at the end of the game, you win!